Poppies is a comfortable home surrounded by beautiful gardens. It is well insulated with gas central heating and gas log fires in the lounge and dining rooms. Reverse air conditioning and fans are available in the master bedroom. Fans and heating devices are available throughout the rest of the house. Lovely to be in any time of year. No 1 The master bedroom has a comfortable king sized bed and ensuite bathroom with heated towel rails. No 3 bedroom has queen sized bed and a new ensuite bathroom with underfloor heating and heated towel rails. No 4 bedroom has 2 extra long single beds that can be converted to a King sized bed if required. There is a separate bathroom newly renovated with underfloor heating, a shower and bath with heated towel rails. We now rent out the whole house that will accommodate up to 8 people in 4 bedrooms with one king sized bed, two queen sized beds and 2 singles. We provide two ensuites (one new) and one full recently renovated bathroom with shower and bath. One ensuite and the main bathroom have underfloor heating. All 3 bathrooms have heated towel racks. No expense has been spared on the beds and linen which includes silk duvets and high thread count cotton sheets. Three TVs - one with DVD player - are also available in 2 bedrooms and the lounge room. Toiletries and bed linen are also provided for your use. Poppies is located within 100 metres of the main shops, restaurants, galleries etc of historic Berrima. This ensures you are only a very short stroll to the popular local eateries of Berrima, and can enjoy your favourite tipple without worrying about driving home afterwards! We are only 3 minutes drive from the very popular Bendooley Estate and E2 wedding venues. We are around 8 minutes drive to Centennial winery/restaurant and wedding venue. On HOT days you can cool off at the local river that is within walking distance of Poppies which has a board and rope swing to entertain the younger ones. We do have a garage if you require this for your valued vehicle. POPPIES IS AVAILABLE only AS A SHORT TERM RENTAL available 7 days per week. Poppies B&B can be rented out for up to 8 people to have the entire house. Poppies can accommodate up to 8 people in 4 bedrooms. You can then have exclusive run of the house which includes a fully functioning kitchen with 2 ovens, large dining room, separate sitting room, 3 bathrooms, separate kitchenette, sun room and outdoor entertainment area with BBQ facilities. 2 bedrooms have a TV and the main lounge also has TV/DVD player. There is also a piano, bookcase and games to keep you amused inside and out. Free WIFI available. Breakfast items such as a selection of cereals, tea and coffee, bacon, free range eggs, tomatoes, bread, milk, butter etc are provided for your use also. Our beautiful outdoor area also has fully functioning gas BBQ and outside seating for entertainment. FROM 2019 tariff is $1000 for 4 adults and $50 extra per person per night up to 8 people for Fri/Sat and Public holidays ( includes GST).It is $30 per child per night too. I have lead a varied life initially coming from NZ after qualifying as a RN. Travelling to Australia UK Europe Sweden then Northern Africa adn then spent 1 year living in Capetown RSA then Zimbabwe (when it was Rhodesia) shows you how old I am. Then after 3 years there during the civil war where I worked as a surgical assistant (where I actually got to operate on minor cases myself). Then back to Sydney and nursing and then a relationship. With 2 kids later I found myself working in the Aged Care industry as a Director of Nursing and later as a CEO of an aged care complex. Following this I was involved in training and accreditation in this industry. After 15 years though I felt I needed new horizons so started up and manufactured Silk clothing label called Simply Silk and Bamboo clothing under a Bambootoo. Now another 15 years later I feel it is time to move on so am trading out of this areas too. I supplied over 200 shops in Australia and NZ for some years, but now the retail market climate has changed and most of these stores have been forced to close. High rents and online shopping the cause of most of these closures. I still have my online retail under Simply Silk and will continue to sell this way until all stock is gone. As they say one door closes adn another opens so will see what my next adventure will be. I met my lovely partner Simon 5 years ago in Berrima and we now live together behind Poppies in a new home that has just been built. This makes it easy to greet guests and show them how everything works etc. We both love to travel and hope to keep doing this. Pod, plunger and instant coffee supplied. Several board games available.Tennis racquets supplied on request as there is tennis court for hire over the road. Courtyard near Kitchen. Property surrounded by extensive landscaped gardens. Gorgeous, charming home with character and every modern convenience. Beautiful gardens and secluded aspect. We drank champagne in the garden, and snuggled into the comfy couches with the cosy fire after dinner. Great location just around the corner from Berrima’s Shops and cafes. Thank you Jen for this comment it means a lot to us. You are very welcome to stay anytime you wish to come to Berrima. We really loved our stay at Poppies in Berrima. Both Ann and Simon were great to deal with in the organisation. The house was large, clean and well looked after. They went out of their way to show us how to use the appliances and gave us some tips on things to do in town. We will be back if they'll have us! Our group very much enjoyed Poppies house. Ideal for a group. 2 - 4 couples or 3 couples with a couple of kids. Plenty of room and a lovely garden to spill out onto as well. Our host, Ann, was very accommodating. From the minute you walk in the door you feel like you are at home. The property itself is wonderful and has everything that you could possibly want even down to the local goods supplied for breakfast. There were three couples staying and we all had our own spacious rooms, two with their own ensuite. Ann and Simon were wonderful hosts and went out of their way to assist. It was so peaceful and quiet, it really was just perfect for a getaway. We would love to stay again, but longer next time. Thank you Julie for your kind comments and yes you are always welcome to stay anytime . Poppies is a great place to stay for a group. Four comfortable bedrooms, two with ensuites plus a main bathroom. Large lounge and dining rooms both with gas fires plus other smaller sitting areas. Well equipped eat-in kitchen with breakfast items provided to cook your own. Nice garden with bbq and seating. 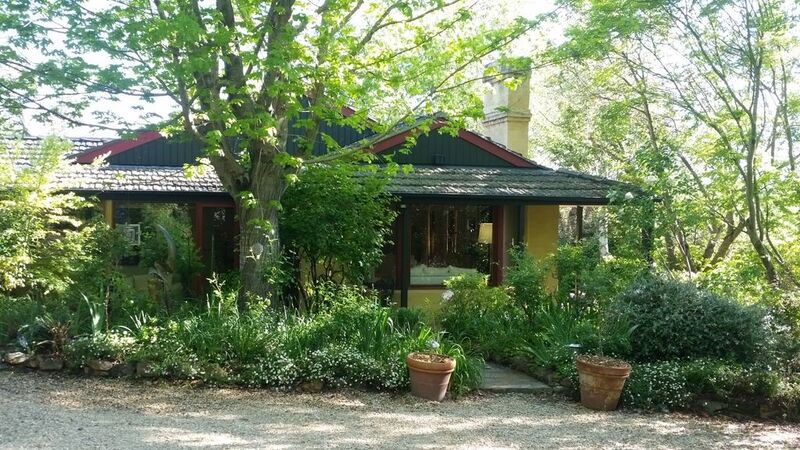 Less than five minute walk to Berrima and very convenient for nearby wedding venues. We had a wonderful stay. Thanks Anne for everything. Thank you to Ann for a wonderful stay at Poppies. From the beginning, we were warmly greeted, with nothing too much to ask. It was so great to have brekky supplied for us. The house was in a perfect location to walk to the best Cafe in town, thanks for the great recommendation to Josh's Cafe! !